Today I’m thrilled to feature the bridal shower invitations for Bailey Amon of Antiquaria, created by Bailey’s business partner (and talented calligrapher) Emma James. You might recognize Bailey and Emma from their regular DIY tutorials here on OSBP, so it’s no surprise that these bridal shower invitations reflect their clever DIY sensibilities. 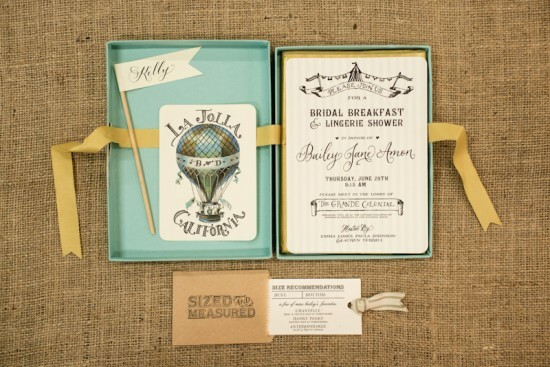 Emma incorporated vintage illustrations and her beautiful hand lettering into the design, which was then accented with ribbons and rubber stamp details. From Emma: Bailey’s wedding was in La Jolla, California and we held her shower on the morning of the wedding. We began with brunch at an adorable cafe called The Cottage and then walked back to her hotel suite for mimosas and presents. For the shower invitations, I wanted to design something really special that would get her guests even more excited about coming to La Jolla. The invitation was hand lettered and printed with an awning striped background. 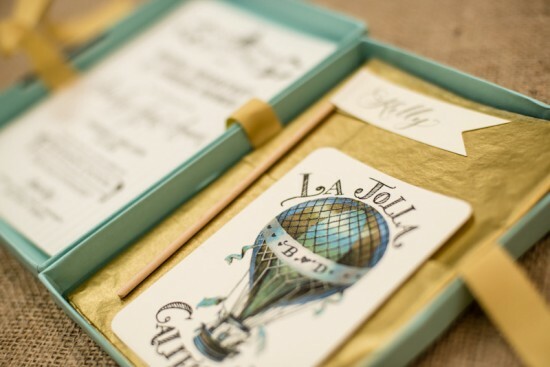 Since Bailey loves hot air balloons I used a vintage illustration of one as the front of the enclosure/rsvp card. 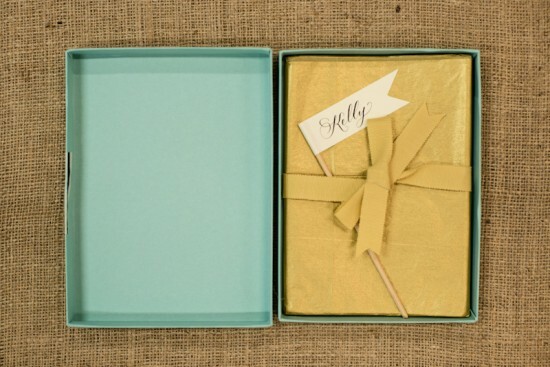 The invitations were mailed in A7 box mailers in pool from Paper Source. I designed a logo for the outside of the box and had it made into a rubber stamp, which was used to emboss the logo on the front of the box. What a beautiful and cheerful invitation! I adore the vintage hot air balloon illustration and lettering. Looks like a real labor of love! Cute invite! Love the colors! I’m going to do a box mailer for my daughter’s birthday party this year, but I’m wondering if you have to wrap it like that or can you just secure the box enough and mail like that? Anybody know? 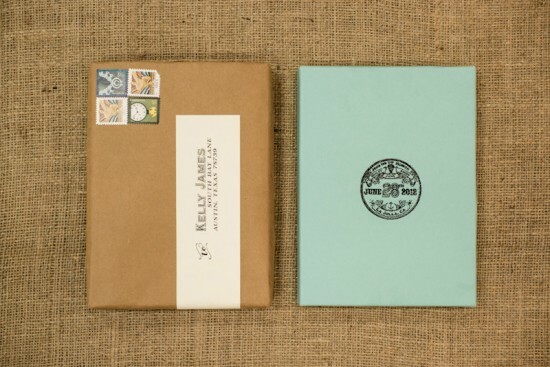 These are gorgeous invitations! Love the fonts and colours.